You know those times you’re going for your maximum weight? The last thing you want to worry about is your ability to grip the floor, or whether or not you have a stable foundation. Proper equipment is vital to a workout, and your shoes are no exception! We’ll give more details about these 3 features later in this article, along with our picks for the best flat weightlifting shoes (Nike Romaleos, Pendlay Lifting Shoe, and the Asics Gel Fortius). Another solution is to pair up one of these top picks for weightlifting shoes with a pair of insoles or orthotics. One brand that some people swear by is Superfeet. Keep on reading for more details about that. Keep on reading for what to look for in a weight lifting shoe. We’ll also share our top recommendations and give some advice about where to buy them. You probably already know that your feet should be planted firmly on the ground if you want to live some serious weight. However, there should also be a slight lift in the heel to give you some extra stability. The best shoes are a balance between the two. Most weightlifting shoes have a heel that measures between .5 and 1 inch, which will give you the extra push you need to lift the bar safely up over your head. The slight lift to the heel also makes it easier to get into a lower position. It’s also useful for increasing the range of motion in your ankle. The raised heel height is also great for flat-footed athletes and will help provide some of the support you’re missing without an arch. What you may not know is that weightlifting shoes often include a strap that is designed to give athletes additional support when they push off the floor. This convenient strap ensures a secure fit. This is important when lifting some serious weight. It will also give your feet and ankles added stability that might be missing due to your low arch. You will also notice that it is easier to put some hip action behind your push if you have a strap. This will give you the added advantage of being able to rise up safely from a deep squat. The best lifting shoes should also include a flat rubber sole to give you plenty of traction and stability. Both of these are important when you are training and weightlifting on a slick gym floor. After all, the last thing you want to worry about is a platform for lifting. The best ones stick to the floor like glue and don’t slide, no matter what! Some weightlifting shoes that are able to provide the support you need during lifts and squats include these stylish and surprisingly affordable pairs. To answer your question, most weight shoes are great for flat feet simply because the footwear is designed to provide stability. Unlike other types of shoes, ones designed specifically for weightlifting can almost seem like they were designed with your low arch in mind. When you find a pair of dedicated weight training shoes, simply make sure that there is a slight lift in the heel, a supportive strap, and flat sole for shock absorbing stability and traction and you will be ready to train and lift weights outdoors or in the gym. We look forward to reading any additional comments and questions you might have. We also encourage you to share this page with family and friends. Here are our featured lifting shoes. There are a lot of models on the market, but we’ve done the research and narrowed down the choices for you. Our top-rated weightlifting shoe for someone with flat feet is the Nike Romaleos. It’s a top-quality shoe with all of the features that we’re looking for. It’s a classic lifting shoe that has been around for years, and for good reason. People love it! Namely, the Nike Romaleos Weightlifting Shoe has a very small lift, strap for additional support, and a very grippy, rubbery sole. People that have tried this shoe, particularly those with low arches seem to love it. 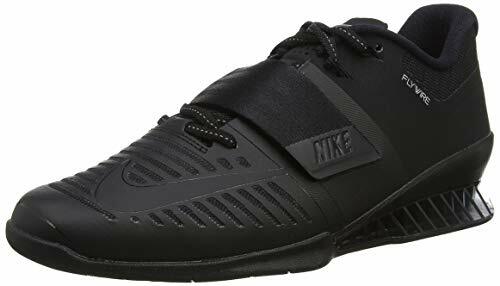 If you have flat feet, but are into weightlifting and powerlifting, you can’t go wrong with these top-rated shoes from a trusted name, Nike. We LOVE this shoe and we’re sure you will too! Check out all the details about this shoe, as well as customer reviews on Amazon. These shoes can be found on the feet of many an Olympic weightlifter. #2: Pendlay Powerlifting Shoe: The Best Squat Shoes? Next up on our list are these ones from Pendlay. They have a reputation for being a durable, sturdy weightlifting shoe that most people seem to love. They also have some great customer reviews over on Amazon, and most people who try them really seem to love. Pendlay Weightlifting Shoes aren’t the most stylish lifting shoe out there, but that doesn’t really matter, does it? What you really need is their excellent support, and wide toe box. 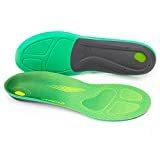 These two features will make them comfortable to wear, even with flat feet, if you don’t want to wear orthotics. These Pendlay shoes are flexible, but firm, and comfortable but still provide the support you need when lifting some serious weight. It can be a little bit difficult to find Pendlay powerlifting shoes in stores, which is why we recommend shopping online. You can head over to Amazon to check them out for yourself. They can help prevent injury and improve your lifting form. Best of all, shipping is often free with Amazon Prime. If you’re looking for an all-round shoe, and not specially a weightlifting shoe, then you’ll need to consider the Asics Gel Fortius. It offers some serious stability, even though it’s not a lifting shoe and most people who try it, seem to love it. These cross trainers can work well for CrossFit workouts focused more on sprinting, jumping, and climbing over things than lifting. Why Consider the Asics Gel Fortius? However, it does lack the support and super stable foundation if you’re going to life serious weight, so we’d recommend sticking with some of the other shoes on this list. Where to Buy these Shoes? If you find your toes lifting off the ground during a heavy lift. Reebok Legacy Lifters are adjustable on the bottom and you should find that this doesn’t happen as much. If you have flat feet or overpronate. They also some serious support, and you could also pair them up with an insole or orthotics. If you’re looking for some extra security over a variety of movements because they have a strap across the midfoot. In short, they’re a top-quality OLY lifting shoe at a very reasonable price. Plus, Reebok makes some excellent workout shoes and they’re a massive step-up from the runners that you might have previously been wearing to the gym. The straps across the top add some serious stability, solid platform, and will help you improve your lifts. And they can help to prevent stress fractures during a serious workout and maintain good form. Check out our full review here: Reebok Legacy Lifters. Or, learn more about these new OLY weightlifting shoes for flat feet over on Amazon for yourself, but only if you want to take your performance level higher! Another popular option for lifting shoe is the Adipower line from Adidas. They’ve been around for year and have many devoted customers. The anti-slip rubber outsole grips the ground extremely well and offers some great traction. You’ll love the strong TPU midsole that offers a lot of stability. Finally, the adjustable strap provides rear-foot stability when lifting some serious weight. The 2 mm heel toe drop is perfect for lifting. It can give you a stable platform, but you won’t feel too fatigued. 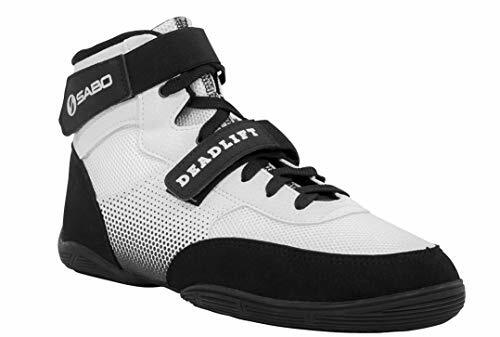 If you’re looking for a pair of workout shoes with excellent durability, nice style, and serious ankle support, then you’ll want to consider the Sabo Deadlift shoes. Although they’re a bit of a newcomer, they’ve quickly attained some serious supporters. What Do People Think about the Sabo Deadlift Shoes? Next up on our list of the best shoes for powerlifting if you have flat feet are these training shoes from NOBULL. Although the company is new to the scene, they’re quickly gaining a huge following among CrossFitters. They’re ideal for weightlifting because of how flat they are, and many people find them especially stable for squatting. Besides lifting, they’re ideal for climbing due to the durable one-piece upper, and they’re supportive and stable enough in the midfoot and heel for someone with low arches. They can also handle some light cardio or sprints like you might encounter during a WOD. These Nobull Trainers should certainly be at the top of any list of crosstrainers for gym or CrossFit workouts. Keep your body safe during a tough workout with a pair of top-quality trainers like these ones. Another top pick for the best squat shoes is the Reebok Nano 8. They’re technically considered cross-trainers, which makes ideal for cardio, sprints, jumping and rope climbs. But where they really excel is for weightlifting. They have a flat heel, grippy sole and a ton of support to help you achieve your personal bests in the deadlift and squat. If you have flat feet, you’ll find these reasonably comfortable. They do have some support in the arch, but it’s not overly aggressive. There are a number of people who swear by barefoot shoes for lifting. Although they don’t offer much in the way of support, this can actually be a positive thing if you have flat feet. Some workout sneakers have quite an aggressive amount of arch support, which can be quite uncomfortable if you have flatter feet. Of the barefoot shoes, the New Balance Minimus is one of our favourites. It has a low heel to toe drop, making it ideal for weightlifting, squats and deadlifts. But, unlike some other kinds, it does offer some nice traction, as well as protection for the soles of the feet. Some flat-footed athletes have also found Chuck Taylors to be a great weightlifting shoe due to the flat sole and slightly raised heel. However, it should be mentioned that this footwear does not have adequate support on the side and through the ankle. It’s for this reason that we don’t recommend them. What about Minimalist Shoes for Flat Feet? 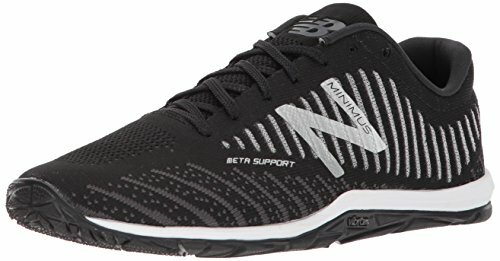 What about other minimalist shoes for CrossFit or weightlifting if you have flat feet? Our advice is the same as for the Chuck Taylors. There just isn’t enough support. You’ll have the best results from something like a weightlifting shoe that has a ton of support built in. You could also consider a training shoe that has some adequate support on the medial side (inside, where your arch is). Another option is to get a neutral shoe (not a big bump where the arch of your foot is) and then use some custom orthotics to give you the support that you need. The easiest way to tell if you have flat feet, high arches, or something in between is to do the pool or beach test. When you’re walking on the beach barefoot, check your imprint in the sand. Or, when you’re walking on a pool deck with wet feet. If you can see only your heel and front of your foot, you have high arches. If you see your heel, front of your foot and a bit of the middle, you have a regular arch height. However, if you see what looks like a stretched out pancake, then you have a low arch, or flat feet. Some people are born with flatter than average feet due to genetics. However, the most common cause of flat feet is loose tendons in the foot. It’s estimated that 25% of Americans suffer from this condition. However, many people never experience any problems with it. Some reasons for loose tendons include: aging, or an injury or illness that damages the tendons in the foot. Overweight people may also put excess pressure on their feet, causing the arches to fall over time. Adult acquired flat feet is most common in women over the age of 40. It’s not really understood why, but some possible reasons include wearing high heels, or having jobs that require standing or walking for excessive periods of time. What are some Problems Associated With Flat Feet? Everyone with flat feet should be wearing good, supportive, sturdy footwear. Avoid the high heels and flip-flops, okay? This will likely lead to some pretty sore feet, and other problems over time. Beyond that, many doctors recommend an insole to provide some extra support to the feet. It’s best to check with your doctor, podiatrist, or physiotherapist to see if this option will work for you. They’ll be able to give you the best advice for your specific situation. There are, however, plenty of people with flat feet who swear by Superfeet. It’s one of the most popular brands of over-the-counter insoles. You could try out one of these pairs of weightlifting shoes we’ve recommended, combined with an insole for the ultimate pair of weightlifting shoes for flat feet. Try it out for yourself and see. How to Fix Flat Feet? Leave a comment below and let us know your thoughts. If you have flat feet, what weightlifting shoe is your top pick? And don’t forget to share this article on Facebook, Twitter, or Pinterest. « Best CrossFit Shoes for High Arches: Find the Perfect Fit! What do you think about the Reebok CrossFit Nano for someone with flat feet? It could work…they have some great support. You could also consider putting some orthotics into them. 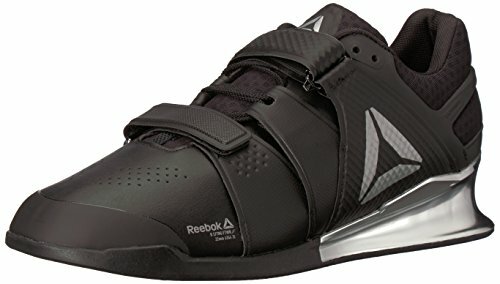 What do you think about the Reebok CrossFit shoes? I’ve heard some mixed reviews about them, and am not sure if they’re a good fit for me, as a beginner to CrossFit. Reebok is one of the most trusted names in CrossFit shoes and you’d likely be very happy with them. Nice article! What about some recommendations for the opposite problem-really high arches? It’s also not easy to find shoes for this situation.